I thought you might like to see pictures of what woke me up on the morning of April 3rd. 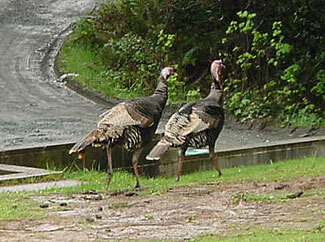 Gobbling up a storm, these turkeys were just standing in the street in front of my house . There were four in all and all appeared to be jakes. I live on a dead-end street on the edge of Coquille, Oregon. 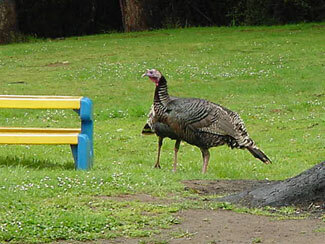 When I heard the gobbling, I thought one of my neighbors was practicing as turkey season was set to start in a few days. These turkeys hung around all morning getting handouts from the ladies in the neighborhood. I even got a chance to call them close with my own calls and enjoyed the practice.